I have not seen a better McHenry Auto in all my travels â€” to shows or on the internet. 11 inches of velvet opening! 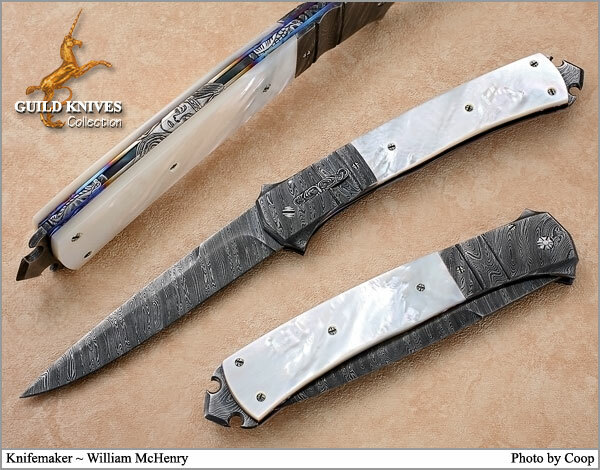 McHenryâ€™s Celtic touch is seen all over the knife by means of his beautiful carvings of womenâ€™s faces to the mystic dragons, Celtic Knots, and all the way to his WM carved into the main pivot screw. Peek inside the knife and way down in the bottom you see a pair of womanâ€™s eyes peering out at you. Study the Celtic Knot rocker release. Can you see another pair of eyes scanning you? Absolutely primo Mother of Pearl scales. Bill is the inventor of many knife innovations, including the AXIS lock. It doesn't get any better.